An unexpected change to the UFC 213 main event didn't stop the interim middleweight title fight between Robert Whittaker and Yoel Romero from turning into a five-round instant classic. The two fighters were bumped up to the headline spot on Saturday and did not disappoint, with Romero storming out of the gate with a strong start before Whittaker powered back late to earn the victory and become interim champion. Whittaker came back despite a knee injury that seemed to slow him down early, but the New Zealand native continued to apply pressure to Romero throughout the final three rounds while adding up the damage with a relentless striking attack. When it was over, Whittaker's offensive onslaught earned him the well-deserved victory. While odds makers were back and forth on the fight in the days leading up to UFC 213, 55 percent of fantasy players had picked Whittaker going into the card, and with the win he earned an extra 150-point bonus because it was a title fight. In the co-main event, Alistair Overeem gutted out a tough third round with former champion Fabricio Werdum to earn a unanimous decision win in this heavyweight showdown. Overeem was selected by 55 percent of fantasy players, although a whopping 73 percent had picked him to win by knockout going into the event. Still, Overeem came through with the victory while also earning an extra 120 points due to the close matchup with Werdum. 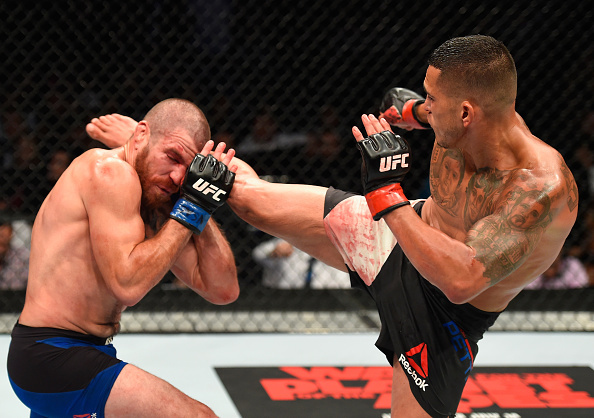 The run of favorites winning on the main card continued with former lightweight champion Anthony Pettis earning a unanimous decision victory against Jim Miller. An overwhelming majority at 81 percent selected Pettis, with another 63 percent correctly predicting that he would win by decision. While the favorites ruled the main card, Aleksei Oleinik picked up a big win as an underdog on the prelims after he pulled off an impressive second-round submission against Travis Browne. The 40-year old-Russian was selected by just 36 percent of fantasy players, although another 48 percent did pick him to win by submission as he wrapped up another finish. As it turned out, Oleinik was one of only two underdogs to get wins based on selections made by fantasy players at UFC 213. Rob Font got the other underdog victory after he beat Douglas Silva de Andrade, with 45 percent of fantasy players picking him on Saturday night. Chad Laprise got a big TKO finish against Brian Camozzi, with 69 percent of players picking him, while Thiago Santos was a massive favorite, with 80 percent of fantasy players correctly predicting his victory against Gerald Meerschaert. Belal Muhammad was another favorite who got the job done with a unanimous decision win over Jordan Mein after 60 percent of fantasy players picked him to win. International Fight Week kicked off on Friday night with The Ultimate Fighter: Redemption Finale, where Justin Gaethje made a spectacular debut with a Fight of the Night performance against Michael Johnson. Gaethje and Johnson engaged in an absolute war, exchanging more than 190 strikes between the them in less than two rounds. After a back and forth battle that saw both men staggered and nearly finished, Gaethje found an opening to land a series of devastating knees that put Johnson down and out for good. Heading into the fight, Gaethje was actually a slight underdog based on the selections by fantasy players, with 43 percent picking him to win. Gaethje pulled off an impressive victory while also earning an extra 40 points for those who picked him thanks to the fight serving as his UFC debut. 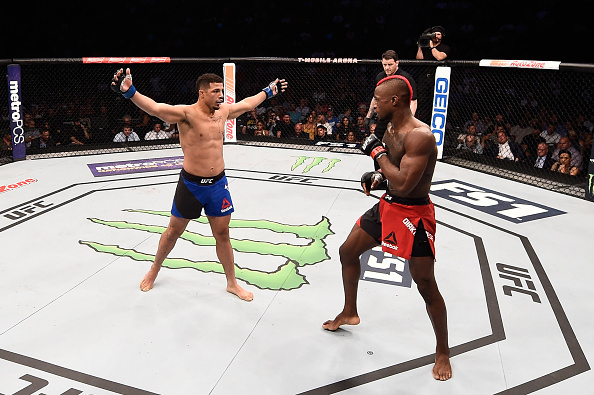 The upsets continued in the lightweight division on the main card as Drakkar Klose kept his undefeated record intact while handing highly touted prospect Marc Diakiese the first loss of his career. Klose was only selected by 12 percent of fantasy players going into the event, but it's safe to say he'll be a popular pick the next time he fights. Brad Tavares kept the underdog streak going with his win over Elias Theodorou in a middleweight matchup on the main card. Tavares was picked by just 30 percent of fantasy players, with another 61 percent correctly predicting that he would win the fight by decision. On the preliminary card, Angela Hill got back on track with a unanimous decision win over Ashley Yoder, with 73 percent of fantasy players picking her in the fight. Meanwhile, CB Dollaway got back in the win column with a hard fought decision over Ed Herman after 72 percent of fantasy players selected him in the light heavyweight matchup. While the upsets were few and far between on the preliminary card, Gray Maynard certainly made a strong statement with his win against Teruto Ishihara in a lopsided victory for the former title challenger. Maynard was picked by just 37 percent of fantasy players, but he also earned an extra 120-point bonus because the fight with Ishihara was so close heading into Friday night. All told, between the fights available to pick from at UFC 213 and The Ultimate Fighter Finale, only six underdogs came away with victories, while an overwhelming majority of 14 favorites got wins during the two International Fight Week cards.